"XAVIER" (XAVIER VILATÓ) (1958, Boulogne-sur-Seine). Xavier Vilató was born in 1958 in Boulogne-sur-Seine, of a French mother and a Spanish father. Coming from a family linked to the world of art, he learned early the techniques of engraving and painting. In 1975 he began his artistic career exposing in various European countries. He works simultaneously with painting, ceramics, engravings and from 2006 with films production. His work is divided into many series. He realized more than 30 individual exhibitions in France and abroad, including two important retrospectives in 2005 at the Picasso’s Native Casa Foundation in Malaga and the Museum of Fine Arts of Cambrai (France) in 2006. In 2013 his work was presented at Barcelona’s Museo Marès during six months (The Incredible Story of the Seed of Love, a multidisciplinary project built around a short film). His work is presented in numerous private and public collections in France, Spain and Portugal, as the National Museum and Art Centre Reina Sofia in Madrid, Actilibre Foundation in Madrid, Paris Doucet Library, the Bibliothèque Sainte-Geneviève of Paris, the Bibliothèque Nationale de France, the Museum of Contemporary Spanish Engraving of Marbella, the Fata Morgana Foundation, the Museum of Graphic Arts of Barcelona, General Council of the Jaén Region, CEPSA Collection, Fundação António Prates. VILATÓ Xavier ("Xavier") There is 1 product. 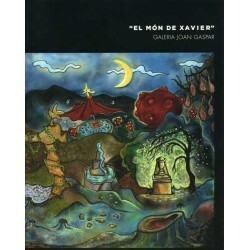 Catalog of the exhibition by Xavier Vilató that took place at Galeria Joan Gaspar in May of 2014. Exhibition of painting and sculture.